My wife and I decided to surprise my mother-in-law for her birthday. It was over Memorial Day Weekend, and we had already baked a cake the previous day for a BBQ. So, we baked another one! I really enjoyed this cake. I like dense cakes, and the frosting was great. 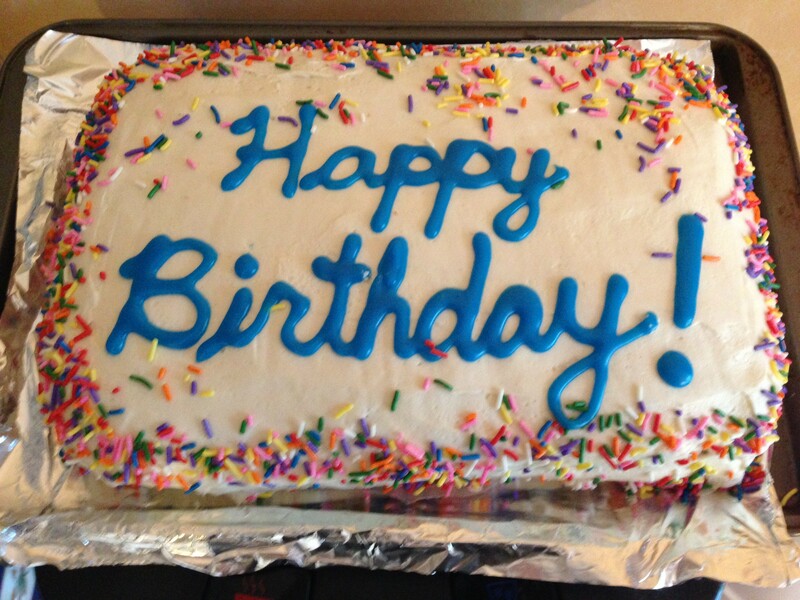 The only problem with it was that I foolishly decided to make this 9″ x 13″ cake into a layer cake. Right. Who does that? Well, I did. It wasn’t the worst decision, though, because it meant more frosting, but it wasn’t really enough cake for that amount of frosting. Next time, I’ll either make it into two 9″ round layers or not make a sheet cake into a layer cake. For the cake: Preheat oven to 350 degrees. Butter and flour a 9″ x 13″ baking pan. In a medium bowl, mix flour, baking powder, baking soda, and salt. Set aside. Whisk in the sugars vigorously, then mix in the egg, yogurt, milk, and vanilla extract until combined. Slowly mix in the dry ingredients until no lumps remain, then slowly add the sprinkles. Pour batter into prepared pan. Bake for 30-35 minutes, or until toothpick inserted into the center comes out clean. Allow to cool. For the frosting: Beat butter on medium speed in a stand mixer for about three minutes. Add powdered sugar, cream, and vanilla extract with the mixer running. Increase mixer to high speed, and beat for three minutes. Add 1/4 teaspoon of salt if frosting is too sweet. Frost cooled cake and decorate with sprinkles, as desired.